I had lunch with two leaders in the marketing technology and software startup space last week. We were discussing some of the biggest challenges marketers are facing today. We all agreed that a common understanding of the difference between an inquiry and a lead continues to be one of the biggest mistakes marketing makes. And this drives a deeper wedge in the goal of marketing and sales alignment. Research shows that as much as 71% of inquiries are completely wasted. And 36% are never followed up on. The Bottom Line: When marketing gathers up new names from contact forms and dumps them over to sales, no one wins. I spent the first 5 years of my career in sales. When I moved to marketing, I committed myself to two things: Marketing should be accountable for driving quantifiable business value. And marketing needs to partner closely with sales. I spent about half my career in marketing creating, tweaking and optimizing the demand generation process, most recently for the world’s largest software company. And in the process, I somehow managed to accomplish both. We delivered a solid return on marketing investment. And we accomplished this by focusing on giving sales what they wanted: truly qualified leads. Someone who downloads a white paper or registers for your webcast is not a lead. Someone who fits into your target demographic profile is not a lead. Someone who reads 10 blogs on your website is not a lead. Someone who clicks on your product / solution pages is not a lead. These are “raw responders.” These are inquiries.These are names and email addresses, and if you are lucky, phone numbers and company names and titles. These people are interested in getting educated on how to solve a problem. Your job is to figure out how many of those inquiries have the potential to become leads you can pass to sales. So here’s the definition: An inquiry is a person who has done something to express interest in understanding how to solve a problem. That problem may or may not be relevant to your product. Your job is to find out if they are relevant. And there is only one way to know: you have to ask them! Sales teams that attempt to follow-up on inquiries cannot make the math work. 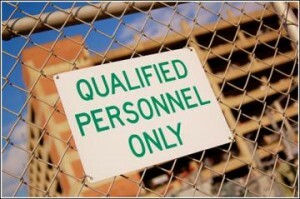 Sure, you might stumble on a qualified lead here and there, but too many inquiries are not qualified. And sales reps are typically not trained as call center telephone sales reps who know how to dial for dollars efficiently. So what is a lead? A lead is a qualified business opportunity. The only way to know whether an inquiry is a qualified business opportunity is to ask them. The most common definition of a lead comes from IBM who developed the BANT system years ago. You must reach the inquiry by phone, and find out if they have the Budget, Authority, Need, and a specific Timeframe for solving their problem. Some have added to or modified the BANT qualification model, but the bottom line is that sales should never see leads from marketing that have not had some direct qualification, performed by a person, to determine if there is a real business opportunity. How Do You Score A lead? To make it easy, just assign a score to each of the criteria in BANT. You could make it 25 points each so that if they answer the right way a qualified lead has a score of 75 or 100. Leads who score under 75 can go into a lead nurture pool and re-contacted in a few weeks. I would recommend weighting the Authority and Needs a little higher. But every business might look at this differently. 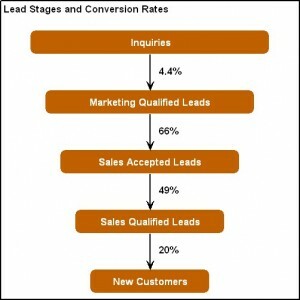 What Is The Average Conversion Rate From Inquiry To Lead? There is a ton of research out there on lead conversion rates, and some of it is even done by industry. Some suggest the average conversion rate from inquiry to lead is 4.4%. Meaning you need 351 inquiries to generate a new customer. Even “best practice” companies are only converting less than 10% of inquiries to truly qualified leads. In my experience, even with a really optimized inquiry generation process will yield around a 4% conversion rate from raw responders. And you should achieve closer to 8% once you scrub out the “Mickey Mouses” and false data registrants. There is a trade off that is worth thinking about: the lower your conversion rate from inquiry to lead, the higher the conversion rate should be from Lead to Sale. This maximizes the efficiency of the sales team so they are closing new business and not chasing unqualified prospects. This also means you are likely not generating nearly enough inquiries. That’s why content marketing is so important to generating cost efficient leads. Attract visitors to your content, convert them to subscribers and nurture them with offers that help them move through the buying process. What Are The Best Lead Stage Definitions? Closed / Won Opportunity: Revenue! 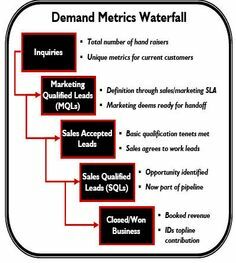 A few years ago, Sirius Decisions updated their Demand Generation Waterfall to cover more complex realities like inbound vs. outbound inquiries and Sales-generated leads. If anything, the change reflects even deeper qualification by marketing, prior to sending leads to sales. The bottom line of all this for marketers: If you are sending inquiries to your sales team prior to a true qualification, you are wasting money and the precious time of your sales team.